The Nespresso CitiZ & Milk Coffee Machine by Magimix is a pricey machine but worth every penny. If you’re looking for a machine that makes fantastic coffee at the press of a button, this could be the best coffee machine for you. The Nespresso CitiZ&Milk Magimix M190 capsule machine makes brewing hot, barista-worthy coffee incredibly easy. It’s high quality and high functionality, however, does come at a high cost. With George Clooney as its spokesperson, it is unlike Nespresso not to take great care in the design of its machines. 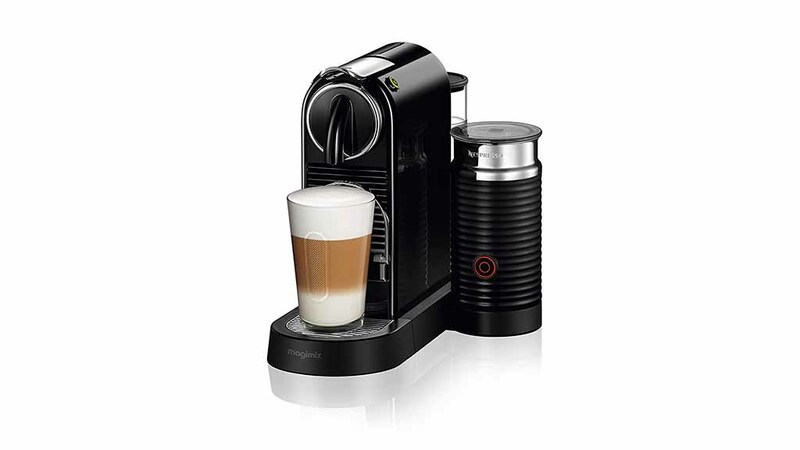 The £209.00 Nespresso CitiZ & Milk Coffee Machine by Magimix is no exception. It is sleek curved edges and heavy-set build gives it the Nespresso quality stamp one expects when paying Nespresso prices. Available in red, chrome, white, silver or black, it is sure to fit with any kitchen décor. However, its 23.7 x 37.2 x 27.7 cm measurements mean you might need to shift around your bench top appliances to make space. See also Nespresso Krups Prodigio review. However, this is in part due to the thought has been put into the size of the Nespresso CitiZ Magimix M190’s water tank, as with its brother, the Nespresso Krups Prodigio. In fact, its capacity is 1 litre, almost the biggest on the market for machines of its kind. Stored out of sight at the back of the machine, users will be able to make multiple cups of coffee before having to refill. As with many coffee capsule machines, the milk frother might not be included. But while it will add nearly £50 to your purchase, it puts the CitiZ&Milk head and shoulders above the plain CitiZ. Unlike the messy and sometimes dangerous steam-spitting metal nozzles on most machines, the integrated Aeroccino milk frother effortlessly heats and froths milk in around 30 seconds. While it is not heated using steam, but a heating element underneath and a small whisk, it means no mess, no third degree burns, no hassle and leaves you with café quality cappuccino milk. See also: The BEST capsule coffee machines of 2017. This machine just couldn’t be easier to use. Fill the tank with water, choose your Nespresso pod flavour, pop it in the slot, pull down the lever and choose your length of pour. That really is it. Its simplicity will be music to the ears of many, however, it’s two-option pour (either espresso or Americano) might not be attractive to others, although I can’t see what more you would need. See also: Smeg ecF01 review – a gorgeous coffee machine with a retro 1950s design. Cleaning? Not an issue. It has a self-descaling function, while the empty pods sit nicely in the disposal container. Once full, it is easily pulled out to be emptied. The Nespresso CitiZ Magimx M190 also has a removable drip tray (as all capsule machines should) which can be rinsed easily as well as removed for taller cups. As well as care for design, Nespresso takes pride in the quality of its coffee. With six families of coffee, each with their own sets of flavours, you’ll be sure to find the one right for you. The quality of all flavours is very high. Sealed I recyclable foil to keep the flavours in, Nespresso’s coffee is, apparently, sourced sustainably from the world’s most well-renowned coffee growing regions. But to really get the most out of a capsule of this calibre, you need the machine to do it. This is where the Nespresso CitiZ & Milk Coffee Machine by Magimix potentially leads the pack. It comes fitted with a 19-bar high-pressure pump that will extract the best coffee out of a capsule every time. Couple this with the water reaching the optimal temperature in 25 seconds, and you could have your perfect capsule coffee machine which pours hot, tasty coffee and always with a thick crema. £209 is a lot of money for a coffee capsule machine (and milk frother). But our assessment is it is worth every penny. Nespresso has not added any unnecessary gimmicks that might hike the price or cut corners in any way. The extra money has brought with it one of the largest water tanks on the market, a market-leading high-pressure pump, and ease of use. Want barista-style coffee in your home? Then the Nespresso CitiZ & Milk Coffee Machine by Magimix is the coffee machine for you. Expensive, yes. But you will never need to upgrade from this machine. It couldn’t be easier to use; the coffee is top line and it will look fantastic in your kitchen. The milk frother is a definite must-have also. Not quite what you’re looking for? Check out our roundup of the Best De’Longhi Coffee Machines.